Most local party supply or department stores will have everything you need. If they don't, make your own free paper decorations with some printable templates and colored construction paper. Of course, access to your loved one's car is required in order to hang all of the decorations. Plan for at least a half hour depending on the amount of decorations. Tell your sweetheart that you have some work to do in the garage or some vehicle maintenance so it's ready for their morning trip to work. If you don't live together, ask to borrow the car for the day to wash it or the keys to check for a lost item you may have left inside. With a copy of the keys and remote, your partner won't suspect anything if you can complete this romantic idea at her/his work parking lot. 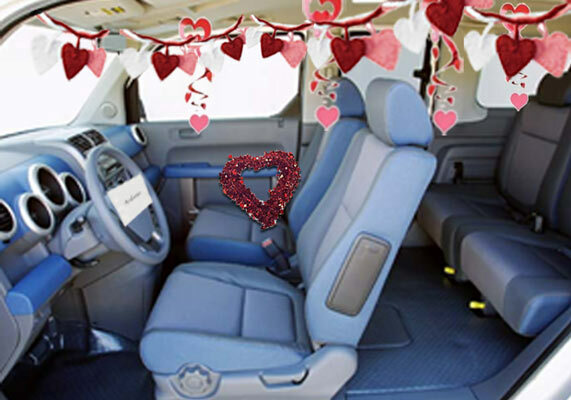 The car interior decoration doesn't have to be all hearts and lovey-dovey. Make a creative theme based on something your partner loves like his/her favorite sports team colors, favorite movie, TV show or character. Print some free clip art. Start by hanging streamers or ribbon from the rear view mirror to the passenger side of the car as the tape alone may not hold the weight of some decorations. If there are handles above the doors, tie the streamer or ribbon to them and across to the other side. Tie tulle around the front seats. Hang garland throughout the car. Scatter balloons along the back seat. Leave a small gift on the passenger seat. Tape hearts or other theme related shapes all around. Write on the windows with a washable window marker. The creative options are completely up to you. Remember that your partner will still need to drive safely so don't cause a hazard by blocking their view with too many decorations. There's no need to overdo it. Complete your car interior decoration by taping (or tie with ribbon) a note or card onto the steering wheel. Use crepe paper streamers as a fast and inexpensive way to decorate in different colors. Twirl the streamer before taping for the best look. Make romantic decorating quick and easy with strands of assorted metallic hearts dangling from a plastic sheet. Tie one end to the passenger sun visor and tape the other side to the rear window. Shimmering metallic heart garland for Valentine's Day or any occasion. Small 25 yard roll of red glitter tulle or choose from other colors based on your theme. Tulle may be used to tie around the front seats or hang. Red foil hearts and white tinsel garland measures 24 feet long. Alternating red and pink glitter hearts strung together on pink satin ribbon garland. Measures 12 feet long each. A window marker washes off with soap and water. It's an easy and fast way to write a loving message on a car window. Choose from multiples colors.